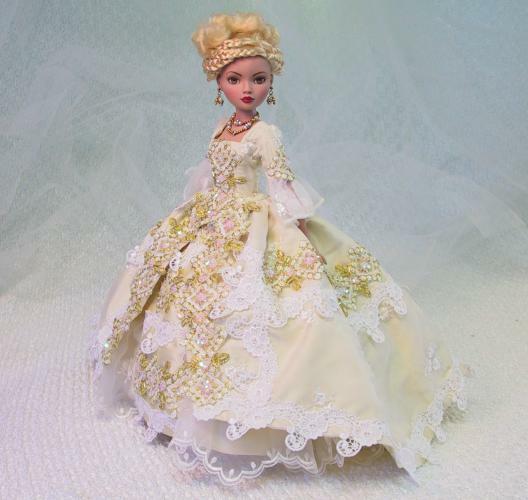 I've had in mind to create an 18th century gown for quite a while and my inspiration for this one was Madame De Pompadour who was very elegant and always wanted to have the latest fashions. Instead of doing an exact reproduction I rearranged it so that it will be easier to sew, and will fall better on our small models. 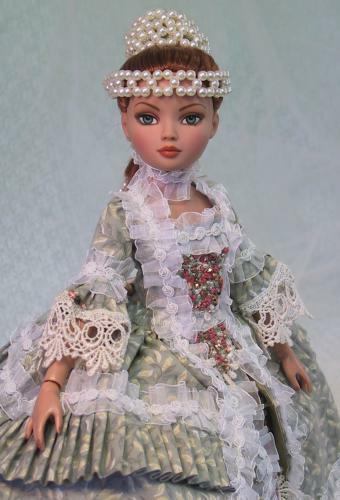 I have attached the stomacher to the overdress to reduce the bulk of hooks and loops, and created a shaping "pannier" by adding some "hips" to the pantaloons. 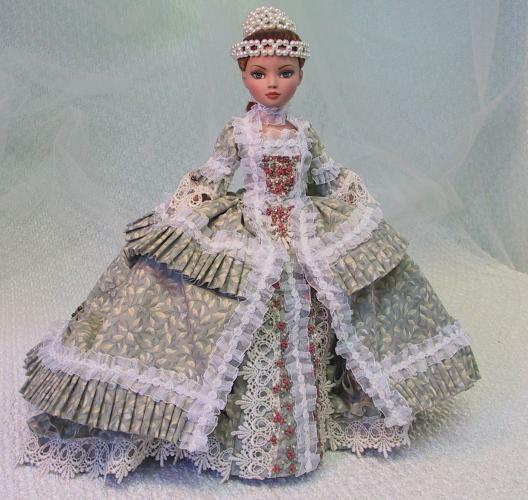 Keep in mind the time period of this gown "More Is Better". So make ruffles, use your vintage lace, make silk ribbon flowers - now is the time to pull out the stops when designing your embellishments! I do hope that you will not be intimidated by the size of this project, one stitch at a time is all it takes! 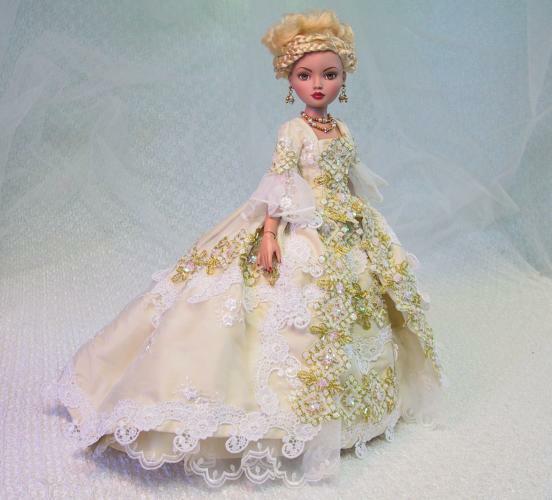 It is a lot of fun to sew and you will be SO proud of your tribute to Madame De Pompadour, a very beautiful and influential woman. Have fun sewing! 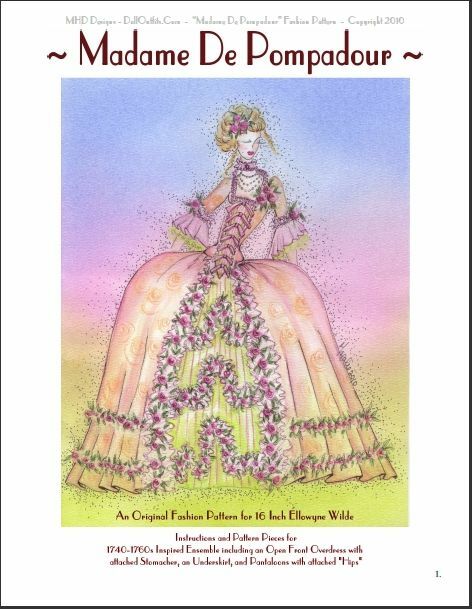 attached Stomacher, an Underskirt, and Pantaloons with attached "Hips"
This pattern is available as a PDF download for $15.00 or you can purchase a pattern that is printed and mailed to your home address for $18.50 (USPS postage to US and Canadian addresses included).